Looked in the fridge and what did I find? 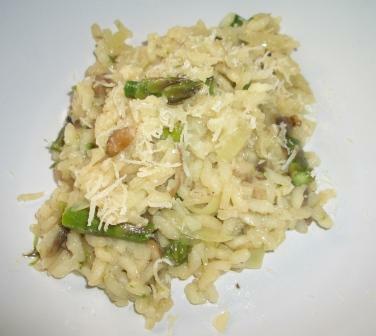 English Asparagus and a few mushrooms, mmm so that will be Mushroom and Asparagus Risotto for tea then! Add a splash of olive oil and a knob of butter to a casserole pan (suitable for the oven) and gently fry the Risotto rice (I use arborio) until it starts to go transparent. Prepare chicken stock and add a crushed clove of garlic (or squeeze of garlic paste), pinch of coarse sea salt, black pepper and a couple of shakes of ground white pepper, as this was a quick tea I used a chicken stock cube and approx half a litre of water. In a different pan I fried the onion in a splash of olive oil and knob of butter until soft and starting to turn golden brown (dont over brown as spoils the look of the dish) throw in the chopped mushrooms and asparagus and fry off for a couple of minutes. Add stock to rice once it starts to go transparent and bring to boil, put lid on casserole pan and transfer to oven for 10 mins and then add further stock or water and onions, mushrooms and asparagus, back to oven for further 5 to 10 mins or until rice is cooked and all fluid absorbed, if not cooked add a bit more water and cook a little more..
dish up and grate some parmesan over and enjoy.. This entry was posted in Eating, Food and tagged asparagus, butter, chicken, easy, english, garlic, mushroom, oil, olive, onion, parmesan, quick, recipe, stock. Bookmark the permalink.